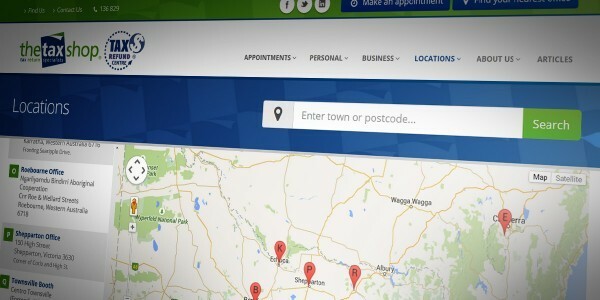 The Tax Shop | Mad Web Skills | Web design, development and hosting in Shepparton, Melbourne, Bendigo, Echuca, Benalla, Central Victoria and beyond. After developing an internal appointment booking system for The Tax Shop back in 2012, Mad Web Skills were approached to bring their old, tired website up-to-date with a sleek, modern design and a responsive layout that works great across all devices. The main challenge with this project was to develop an online appointment booking form to allow clients to make an appointment to see a staff member at their nearest office. This form required a direct connection to their back-end appointment booking server to show appointment availability, verify made appointments via email, and send SMS reminders 24 hours prior to their appointment. Office locations list with Google Maps integration and town/postcode search. Secure connection to protect submitted client details (SSL).